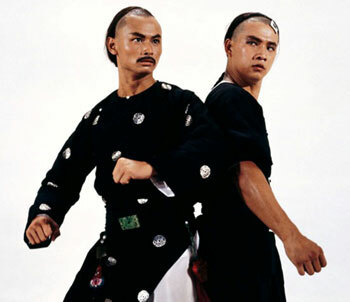 Gordon Liu and Wong Yue in Dirty Ho. Cult classic featuring a fantastic performance by Gordon Liu Chia-Hui. Hilarious and action-packed, Dirty Ho is nothing less than a Shaw Brothers masterpiece. While it does claim the single greatest title in cinema history, Dirty Ho has a lot more going for it than just an unintentionally hilarious moniker. Directed by legendary filmmaker Lau Kar-Leung, the film features Wong Yue as Ho Chih, an impetuous young jewel thief who considers himself quite the big shot - that is, until he meets Wang Qinqin (the great Gordon Liu Chia-Hui), a wealthy wine connoisseur who is far more than what he seems. Little does anyone know that Wang is actually a prince in disguise who has absolutely no interest in ascending to the throne. In truth, the 13th prince would rather spend his days admiring art, checking out antiques, and drinking fine wine. The film begins with both of these men battling for the attentions of the beautiful women populating a local brothel. Their comic game of one-upmanship is soon interrupted, however, when the cops show up, looking for some stolen jewels. Guilty as charged, Ho is taken away as the culprit, but Wang is able to keep the young punk out of serious trouble by subtly flashing his royal ID. Of course, Ho doesn't realize that Wang has done him a great favor and later returns to the brothel to seek some measure of revenge. Although a master of the martial arts, Wang chooses to stay in character and pretend that he doesn't know any kung fu. When Ho attacks, Wang claims that the courtesan Tsui Hong (Kara Hui Ying-Hung) is his bodyguard, much to the girl's surprise. Thanks to Wang's subtle assistance, Tsui Hong suddenly appears to be a formidable opponent for Ho, beating him senseless and even leaving Ho with a nasty cut on his head via a poisoned-tipped sword. Ho retreats into the night, but later finds that the cut simply refuses to heal. Worried that he might die, Ho returns looking for Tsui Hong, but she is nowhere to be found. Apparently, the benevolent Wang used his immense wealth to buy her freedom. To Ho's relief, Wang claims to know how to cure the wound, but his terms prove to be awfully steep for the extremely proud Ho Chih. In order for him to receive the antidote, Ho must kowtow to Wang and call him master, a price Ho grudgingly agrees to pay. The reason for this set-up is simple: Wang sees great promise in Ho's martial arts ability, but is disappointed in the way he chooses to wield it. Believing that he can reform the young man through training, Wang creates a situation in which Ho becomes his disciple. And by choosing to only administer the antidote in small doses every few days, Wang is able to keep Ho around long enough to impart some sage-like knowledge into the young scamp. But while these two are getting to know each other, it seems that Wang's elder brother, the evil fourth prince is seeking to wipe out all other potential heirs to the crown before the Emperor announces his successor. Wang's interest in wine, women, and song means nothing to the fourth prince, who orders the powerful General Liang (Lo Lieh) to assassinate him. Liang sends several different hired killers (including two played by Johnny Wang Lung-Wei and Hsiao Ho), each trying and ultimately failing to defeat the formidable Wang Qinqin. But during one fateful melee, Wang ends up getting stabbed in the leg, and it's up to Ho to help his master get to safety. With Wang's true identity revealed, Ho dedicates himself to a series of grueling training exercises in order to help his master overcome the deadly assassination plot. With Wang now wheelchair-bound and a pack of skilled archers hot on their tail, Ho and his master have a lot to deal with on their journey to the Emperor's palace. Soon, they realize it's only through their combined strength that they can overcome General Liang and his forces. From its wonderfully stylized, backstory-filled opening credit sequence to its thrilling, amazingly choreographed finale, Dirty Ho amounts to one of the best martial arts films ever to come out of the Shaw Brothers studio. Although more famous for 36th Chamber of Shaolin, Gordon Liu Chia-Hui is really given a chance to shine in the role of the 13th prince. Liu has played the traditional stoic sifu role many times before, but with Wang Qinqin, Liu is more playful and sly, making his character all the more well-rounded and charming. While Wong Yue cannot hope to match the charisma of his talented co-star, he handles himself well in the title role, creating an immensely likeable protagonist. Simply put, Dirty Ho is probably one of the best kung fu comedies ever made. While it succeeds as a straightforward martial arts film, Dirty Ho possesses a delightful sense of humor, often taking the time to send up various clichés prevalent in the martial arts genre. The hilarious, blood-gushing Crippled Avengers parody featuring "The Four Handicapped Devils" is a real treat, as is the confrontation between the heroes and the strangely fey "Seven Bitters of the East River." Of course, a kung fu film is nothing without action. And although the fighting is perhaps not as speedy as most post-Police Story era martial arts flicks, the action set pieces in Dirty Ho are so elaborate and intricately choreographed (and oftentimes shot in a single take) that you can't help but be impressed by the work that went into each scene. In martial arts films, there's always the chance that the audience will suffer "fight fatigue" thanks to an overabundance of action sequences, but here, Lau Kar-Leung makes sure that every battle is unique, often including a clever or comic twist to keep audiences interested. For instance, before Wang stands revealed as the 13th Prince, he has to fight with his enemies in such a way that no one will notice. It's a charming, if unbelievable conceit, as Wang and the assassins seem to be engaged in normal conversations and actions. However, under the surface, they're actually battling it out using whatever props they have at hand, all in the hopes that the clueless Ho won't notice a thing.